The Airbus Foundation, the European Space Agency (ESA) and Autodesk are teaming up to launch the “Moon Camp,” an inspirational and educational online competition to spark the next generation’s interest in Science, Technology, Engineering and Mathematics (STEM) — the initiative was announced at the International Astronautical Congress in Bremen, Germany. 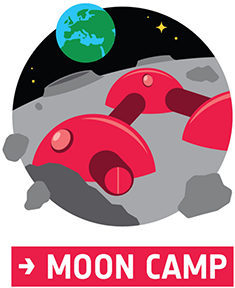 The “Moon camp” competition, based on the Airbus Foundation Discovery Space’s inspirational content and the ESA Education Office’s classroom resources, challenges children to design their own Moon Camp using one of Autodesk’s 3D design tools (Tinkercad or Fusion 360). Participants will have to factor in different parameters such as local resources, energy, recycling systems, and protection from meteorites and radiation. Winners of the competition will attend a webinar with an ESA astronaut and a mentoring session with an Airbus Space Engineer. The “Moon Camp” competition will be running from October 4, 2018, to 16 March 16, 2019. All related resources are available for free on the Airbus Foundation website. Tom Enders, Airbus CEO and Chairman of the Airbus Foundation, said that as a global company, Airbus want to support youngsters who are fascinated by space exploration as well as keen to try their hand on space technology. With the ever-rising importance of technology, it is up to companies such as Airbus to inspire the next generation so they will be able to solve some of society’s most pressing challenges.